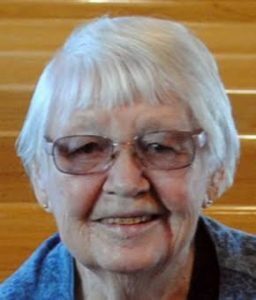 Verona Aileene (Krengel) Knakmuhs, age 88 of Revere, passed away Saturday, February 9, 2019 at the Sanford Tracy Medical Center. Funeral Services will be held at 10:30 a.m. Thursday, February 14, 2019 at the Walnut Grove United Methodist Church. Visitation is 5:00-7:00 p.m. Wednesday at the Walnut Grove Funeral Home. Visitation will continue one hour prior to the service at the church on Thursday. Private family interment is in the Walnut Grove Cemetery. Stephens Funeral Service – Walnut Grove Funeral Home is assisting the family with arrangements. Verona Aileene (Krengel) Knakmuhs was born March 31, 1930 in Lamberton MN, to August and Hattie (Jaeger) Krengel. She graduated from Walnut Grove High School in 1948. On September 24, 1948, Verona married Robert Knakmuhs at the Walnut Grove Methodist Church Parsonage. She was a member of the United Methodist Church Circle. Verona enjoyed knitting, crocheting, and quilting. Some of her hobbies included gardening, attending yard sales, and collecting salt and pepper shakers. Verona especially loved going to Jackpot Junction Casino. She enjoyed cooking meals during the fall and spring, especially her apple crisp. Verona loved traveling with her friends, Henry and Gurly Martius, and spending time shopping with her grandchildren. Verona is survived by her children: Darold Knakmuhs of Revere and Loren “Bo” (Kathy) Knakmuhs of Walnut Grove; 7 grandchildren; 19 great grandchildren; 10 great great grandchildren; sisters-in-law: Evelyn Hanish and Jean Knakmuhs; and many nieces, nephews, other relatives and friends. She is preceded in death by her husband Robert “Bob” Knakmuhs; daughter Marilyn Weedman and husband Denny; parents August and Hattie (Jaeger) Krengel; sisters Ora Erickson and Lorraine Suddeth; brothers-in-law Truman Erickson, George Suddeth, Harley Knakmuhs, Carlos Knakmuhs, Meryl Hansen, and Bill Hanish; and sister-in-law Iola Hansen.